This is a criminal's most terrifying nightmare: being questioned by Officer Hollibaugh. He has kept the mean streets of the town safe because the crooks have heard the stories of the intense pain and agony Officer Hollibaugh inflicts when he has you in his private interrogation room. But one young punk doesn't believe any man can be so powerful and he tempts fate by "accidentally" stealing a purse. He is of course caught and handed over to Officer Hollibaugh for "special" treatment. What happens in the private room will blow your mind: the power of Officer Hollibaugh is let loose and the crook suffers unimaginable pain and fear. Officer Hollibaugh shows no mercy as he methodically and sadistically rips the punk apart. Lifting him, crushing him, squeezing him, dominating him with raw power. The punk's feeble pleas and desperate struggles only seem to amuse the most powerful policeman to ever walk the earth. The rule book is thrown out as Officer Hollibaugh enjoys inflicting mind-warping pain on the punk. Will he get the confession? Will he stop the torture when he does? Don't count it! What would it be like to wrestle one of the strongest men on Earth? What if there were no rules? This is what happens to a guy one day when Brad decides he feels like wrestling. Our victim doesn't stand a chance! 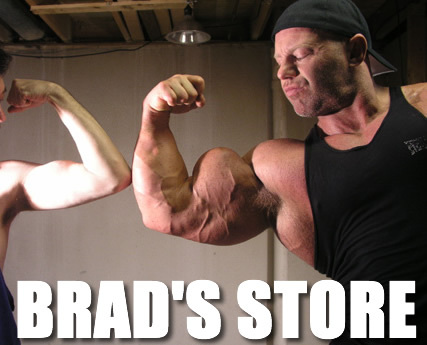 Brad totally overwhelms him with pure, bone-cracking power. He becomes nothing more than a wrestling toy for the Big Man. He is lifted, crushed, slammed, twisted, bent, and verbally humiliated for nearly an hour. Brad shows no mercy as the victim's head is slowly crushed between massive thighs that press more than a ton. And Brad is just warming up! The intense pain experienced by Brad's wrestling toy is beyond definition - how he survived is a pure miracle. You asked to see a darker side of Brad and with this DVD, Brad is opening up and letting you see that side of him. There will be no turning back!